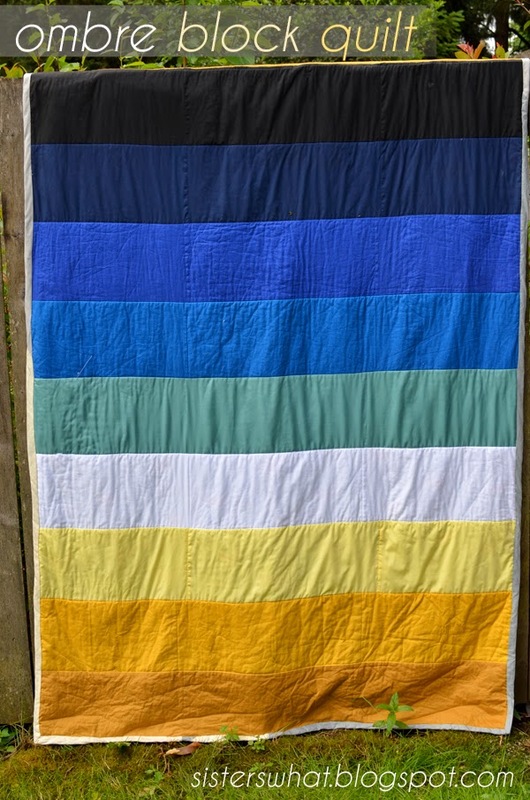 ' Sewing and Quilting Week - Ombre Block Quilt - Sisters, What! This week we have some really fun posts planned for you. Quilting is a favorite hobby among a few members in our family. 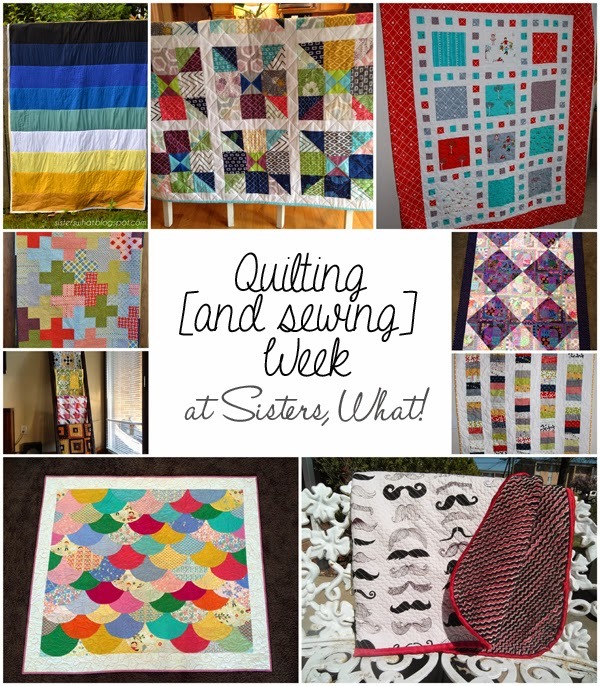 This week we're going to showcase some recently made quilts and some other fun sewing projects. Then at the end of the week we're going to have a really fun fabric giveaway from Fat Quarter Shop. So make sure to stay tuned! Make sure to check out some of our past quilts that we've made HERE. To start of this week I thought I'd share a quilt I recently made. I by no means consider myself a quilter, I've only made one non-tie quilt (see Alice quilt here). Anyway, while ago I saw this awesome ombre block quilt on pinterest (can't seem to find it now), anyway I decided that would be the perfect twin size blanket for Captain Awesome's bed. I picked out solid color fabric that looked good together. The fabric wasn't wide enough for the fleece, so I had to piece the blocks together and of course I miscalculated. Basically if you look close enough you can see lines don't match up. Hubby didn't think it was a big deal, I just try to not notice. For the back I let Captain Awesome pick out what he wanted. I gave him of the option between two ultra cuddle fabrics. 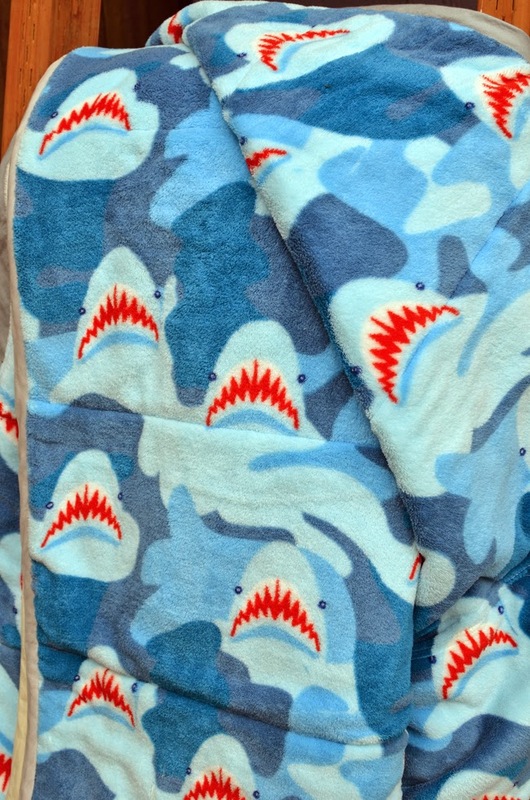 He of course picked the shark fabric (from Joanns-bought about 2 months ago). I tried not to imagine the potential nightmares caused by sleeping under sharp teeth sharks...well at least I'd have nightmares. Anyway, I then quilted it together but because it was so big I wasn't comfortable doing a pattern, so I just stitched in the ditched quilted. Next time I think I might try a pattern. In all, I love the simplicity of the blocks and ombre colors. Captain Awesome loves it too! Come back tomorrow for some more fun quilts!